Brisbane Plumbing and Drainage offers a variety of roof and guttering services throughout Brisbane. From the installation of new gutters to the repair and restoration of existing gutters, we’ve got the experience and the know-how to help with all your gutter and roof problems. A leaking roof or gutter can cause serious structural damage if it’s not repaired. Signs that you have a leak can include stains or mould on your ceiling, wet insulation, and water entry inside your property. If leaks in your roof or gutters aren’t repaired quickly the problem is likely to escalate, causing damage to your walls, fittings, furniture, and house structure. The extent of damage can be reduced along with repair costs, if we’re asked to fix the problems when they occur, instead of leaving it until it’s too late. Storms are responsible for many of the roof and gutter repairs that we get called out to fix. Apart from the obvious things such as breaks and cracks and tin sheets or roof tiles blowing off, heavy rain and wind can cause water to run in a different way down your roof than it normally would – and it’s this which causes leaks and floods. If you’ve been unfortunate enough to suffer damage to your roof or gutters as a result of a storm, then call us right away and we’ll send one of our experienced technicians to your home or business at a time that fits in with you. They’ll give you an honest appraisal of the situation and make sure that you understand the work involved. We’ll never talk you into having work done that isn’t necessary. 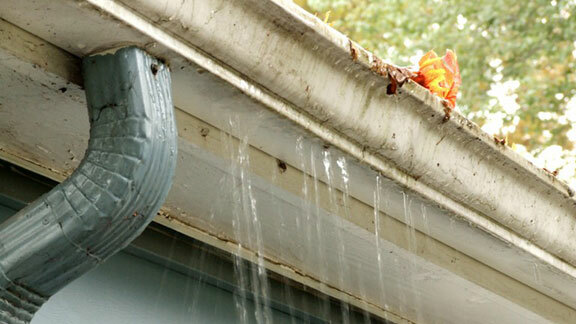 If, on inspection, your gutters appear to be pretty sound but are showing signs of wear or tear, then in most instances we recommend repair over gutter replacement, since this is typically the cheapest alternative. We’ll assess the level of damage and discuss whether a repair is possible. If your repair is only minor, then most times we can fix it within a day. For major repair work or a very large property, then it’s more likely to take up to 3 days. Our team of highly trained contractors has the experience to install new guttering on both residential and commercial properties. We recommend Colorbond steel gutter systems which deliver long-lasting performance when properly installed and maintained. Available in 22 colours, there’s sure to be one to match or complement your existing décor. Sometimes, however, we’re limited to the type of guttering we can use based on the way the property has been constructed or the property’s siding, but wherever possible we’ll install guttering to suit your preference and/or budget. Is your roof leaking? Do you need a new downpipe fitting? Or is a section of your guttering rusty? Trust Brisbane Plumbing and Drainage with your roof or gutter job. We employ fully licensed plumbers so you can rest assured that your job will be carried out by professional tradesmen in accordance with the standards of the Australian plumbing code.